Twenty three years ago, on October 29, 1985, the Global Community organization was created. Everything you ever wanted to know about the biggest economic meltdown since the Great Depression but were afraid to ask. A speculative bubble occurs when price far outstrips the fundamental worth of the asset. Bubbles have occurred in everything from real estate, stocks and railroads to tulips, beanie babies and comic books. As with all bubbles, it took more and more money to make a return. In 1996, the Fed allows regular banks to become heavily involved in investment banking, which opens the door to conflicts of interest in banks pushing sketchy financial products on customers who poorly understood the risks. In 1999, under intense pressure from financial firms, Congress overturns Glass-Steagall, allowing banks to engage in any sort of activity from underwriting insurance to investment banking to commercial banking (such as holding deposits). Many Americans joined the stock mania literally in the last days and lost considerable wealth, and some, such as Enron employees, lost their life savings. When the stock market bubble erupted, turbulence rippled through the larger economy, causing investment and corporate spending to sink and unemployment to rise. Then came the Sept. 11, 2001, attacks, generating a shock wave of fear and a drop in consumer spending. Burned by the stock market, many people shifted to home purchases as a more secure way to build wealth. By 2002, with the economy already limping along, former Federal Reserve Chairman Alan Greenspan and the Fed slashed interest rates to historic lows of near 1 percent to avoid a severe economic downturn. Low interest rates make borrowed money cheap for everyone from homebuyers to banks. This ocean of credit was one factor that led to a major shift in the home-lending industry -- from originate to own to originate to distribute. Low interest rates also meant that homebuyers could take on larger mortgages, which supported rising prices. In the originate-to-own model, the mortgage lender -- which can be a private mortgage company, bank, thrift or credit union -- holds the mortgage for its term, usually 30 years. Every month the bank* originating the mortgage receives a payment made of principal and interest from the homeowner. If the buyer defaults on the mortgage, that is, stops making monthly payments, then the bank can seize and sell a valuable asset: the house. Given strict borrowing standards and the long life of the loan, it's like the homebuyer is getting married to the bank. *Shorthand for any mortgage originator. In the originate-to-distribute model, the banks sell the mortgage to third parties, turning the loans into a commodity like widgets on a conveyor belt. By selling the loan, the bank frees up its capital so it can turn around and finance a new mortgage. Thus, the banks have an incentive to sell (or distribute) mortgages fast so they can recoup the funds to sell more mortgages. By selling the loan, the bank also distributes the risk of default to others. The banks made money off mortgage fees, perhaps only a few thousand dollars per loan. Because they sold the loan, sometimes in just a few days, they had no concern that the homebuyer might default. Banks began using call centers and high-pressure tactics to mass-produce mortgages because the profit was in volume--how many loans could be approved how fast. This was complemented by fraud throughout the realestate industry, in which appraisers over-valued homes and mortgage brokers approved anyone with a pulse, not verifying assets, job status or income. And the mushrooming housing industry distorted the whole economy. Of all net job growth from 2002 to 2007, up to 40 percent was housing-sector related: mortgage brokers, appraisers, real-estate agents, call-center employees, loan officers, construction and home-improvement store workers, etc. To make the loans easier to sell, the banks go to Fannie Mae or Freddie Mac and get assurance for conforming (or prime mortgages*). Assurance means one of the agencies certifies that the loans are creditworthy; they also insure part of the loan in case the homeowner defaults. Before their recent nationalization, Fannie and Freddie were government-sponsored entities (GSEs). While anyone could buy shares in the two companies, they were also subject to federal regulation and congressional oversight. This federal role was seen as an implicit guarantee: While there was no explicit guarantee, all parties believed loans backed by Fannie and Freddie were absolutely safe because the government would not let the two agencies fail. This allowed them to borrow huge sums of money at extremely low rates. *Prime refers to the credit score of the borrower. Banks then sold their newly acquired assured prime mortgage loans to bundlers, ranging from Fannie and Freddie to private labels, such as investment banks, hedge funds and money banks (ones that hold deposits like savings and checking accounts. Bundlers pooled many mortgages with the intention of selling the payment rights to others, that is, someone else pays to receive your monthly mortgage payments. The next step was to securitize the bundle (a security is a tradable asset. Much of the financial wizardry of Wall Street involves turning debts into assets. Say you're Bank of America and you sell 200 mortgages in a day. Lehman Brothers buys the loans after they are assured and bundles them by depositing the mortgages in a bank account -- that's where the monthly payments from the 200 homeowners go. Then, a mortgage-backed security (MBS) is created from this bundle. An MBS is a financial product that pays a yield to the purchaser, such as a hedge fund, pension fund, investment bank, money bank, central bank and especially Fannie and Freddie. The yield, essentially an interest payment, comes from the mortgage payments. How does it work? The homeowner keeps making monthly mortgage payments to Bank of America, which makes money from the fees from the original mortgage and gets a cut for servicing the mortgage payments, passing them on to Lehman Brothers. Lehman makes money as a bundler of the mortgages and underwriter of the mortgage-backed security. The purchaser of the mortgage-backed security, say, Fannie Mae, then gets paid from the bank account holding the mortgage payments. At first, this process covered only prime mortgages because Fannie and Freddie could not assure subprime loans. To address low rates of home ownership among low-income populations and communities of color, around 2004 Congress began encouraging Fannie and Freddie to start assuring subprime mortgages on a wide scale. And easy credit fed investors' appetite for more and more mortgage-backed securities, which provided funding for new mortgages. One definition of subprime loans is any loan at an interest rate that is at least 3 percentage points more than a prime loan. Many of these loans were adjustable-rate mortgages (ARMs) with teaser rates. The rate was low for the first few years, but then it would reset, causing monthly payments to leap dramatically, sometimes to two or three times the original amount. Subprime borrowers are considered riskier to lend to because of low credit scores. Subprime borrowers are concentrated among people of color and immigrant and low-income communities, partly because racial and class disparities result in less access to banking services such as credit cards, online billing and checking and saving accounts. Bill paying becomes a labor-intensive process, making it much more likely that payments will be late or missed, driving down credit scores. With mortgage brokers and lenders pushing loans on anyone and everyone, those with less financial acumen -- disproportionately low-income people, immigrants, the elderly and communities of color -- often found themselves with mortgages that became unaffordable. With the surge in mortgage loans, around 2004, banks started extensively using financial products called collateralized debt obligations (CDOs). The banks would either combine mortgage-backed securities they already owned or bundle large pools of high-interest subprime mortgages. CDOs were sliced into tranches -- think of them as cuts of meat -- that paid a yield according to risk of default: The best cuts, the filet mignon, had the lowest risk and hence paid the lowest yield. The riskiest tranches, the mystery-meat hotdogs that paid the highest yield, would default first if homebuyers stopped making payments. This was seen as a way to distribute risk across the markets. The notion of distributing risk means all the market players take a little risk, so if something goes bad, everyone suffers but no one dies. Tranches were given ratings by services like Standard & Poor's, Moody's and Fitch. The highest rating, AAA, meant there was virtually no risk of default. The perceived safety of AAA meant a broad variety of financial institutions could buy them. And because tranches were marketed as a tool to fine-tune risk and return, this spurred a big demand. There was a conflict of interest, however, because the rating services earned huge fees from the investment banks. Moody's earned nearly $850 million from such structured finance products in 2006 alone. The investment bank also bundled lower-rated mortgage backed securities, like BBB -rated ones, and then sliced them to create new tranches rated from AAA to junk. This was like turning the hotdogs into steaks. Furthermore, the banks would hedge the tranches, another way of distributing risk, by purchasing credit default swaps (CDSs) sold by companies like AIG and MBIA. The swaps were a form of insurance. This was seen as a way to make tranches more secure and hence higher rated. For instance, say you're Goldman Sachs and you have $10 million in AAA tranches. You go to AIG to insure it, and the company determines that the risk of default is extremely low so the premium is 1 percent. So you pay AIG $100,000 a year and if the tranche defaults, the company pays you $10 million. But CDSs started getting brought and sold all over the world based on perceived risk. The market grew so large that the underlying debt being insured was $45 trillion -- nearly the same size as the annual global economy! Also around 2004, things began to get even trickier when investment banks set up entities known as structured investment vehicles (SIVs). The SIVs would purchase subprime MBSs from their sponsoring banks. But to purchase these MBSs, the structured investment vehicles needed funds of their own. So the SIVs created products called asset-backed commercial paper (short-term debt of 1 to 90 days). Asset-backed means it is backed by credit from the sponsoring bank. The SIVs then sold the paper, mainly to money market funds. In this way, the SIVs generated money to purchase the mortgage-backed securities from their bank. The SIVs made money by getting high yields from the subprime MBSs they brought, while paying out low yields to the money markets that purchased the commercial paper (profiting from a spread like this is known as arbitrage). Wall Street's goal was to conjure up ways to make money while not encountering any liability. It was moving everything off-book to the SIVs to get around rules about leveraging. Banks, hedge funds and others leverage by taking their capital reserves -- actual cash or assets that can be easily turned into cash -- and borrowing many times against it. For instance, Merrill Lynch had a leverage ratio of 45.8 on Sept. 26. That means that if Merrill had $10 billion in the bank, it was playing around with $458 billion. The Federal Reserve is supposed to regulate reserves to limit the growth of credit, but the SIVs were one method to get around this rule. More leverage also meant more risk for the bank, however, because funds could disappear quickly if a few bets went bad. This is all part of what's called the Shadow Banking System, meaning it gets around existing regulations. It was deregulation that led to the huge growth of the shadow banking system. In 2004 Wall Street successfully lobbied the Securities and Exchange Commission to loosen regulations on how much they could leverage against their capital reserves. This allowed the companies "to invest in the fast-growing but opaque world of mortgage-backed securities; credit derivatives, a form of insurance for bond holders; and other exotic instruments," according to the New York Times. The only real oversight left in place was self-policing by the investment banks themselves to determine if they were putting investors at risk. The whole process worked as long as everyone believed housing prices would go up endlessly. This is a form of perceptual economics, one principle of which is that any widely held belief in the market tends to become a self-fulfilling prophecy. In the case of housing, homeowners took on ever-larger mortgages in the belief that prices would keep rising rapidly. Mortgage lenders believed the loans were safe because even if the homeowner defaulted, the mortgage holder would be left with a house that was increasing in price. Confidence in rising prices led the creators and purchasers of mortgage-backed securities to think these investments were virtually risk-free. This also applied to over-leveraging -- as long as there was easy credit and quick returns to be made, investors clamored for more mortgage-backed securities. And this applied to the money market funds that brought the paper from structured investment vehicles. As long as the money market funds had confidence in the system, they didn't cash out the commercial paper when it came due, but rolled it over at the same interest rates. This allowed the SIVs to mint money without posing any liabilities for their sponsoring banks. This system kept the U.S. economy chugging along for years. For some 35 years, real wages have been stagnant for most Americans, but as house values skyrocketed over the last decade, many homeowners refinanced and cashed out the equity -- turning their homes into ATMs. For example, if you owed $200,000 on a mortgage but the house value rose to $300,000, you could potentially turn the $100,000 difference into cash by refinancing. By 2004, Americans were using home equity to finance as much $310 billion a year in personal consumption. This debt-driven consumption was the engine of growth. U.S. over-consumption was balanced by over-production in many Asian countries. Countries like China, India, Taiwan and South Korea run large trade surpluses with the United States, which speeds their economic development. They invest excess cash in U.S. credit instruments ranging from corporate debt and MBSs to government bonds and bills. It's what economists call a virtuous cycle: we buy their goods, helping them develop, while they use the profits to buy our credit, allowing us to purchase more of their goods. But it's also unsustainable. A country cannot over-consume forever. In the final stage of the housing bubble, fewer first-time buyers could afford traditional mortgages. Rising house prices required ever-larger down payments so subprime mortgages multiplied, as they often required little or no money down. From 2004 to 2006, nearly 20 percent of all mortgage loans were subprime loans. As the vast majority were adjustable-rate mortgages (ARMs), this created a time bomb. The minute interest rates went up, the rates reset, and homeowners with ARMs were saddled with larger monthly payments. Various factors combined to slow real-estate prices and deflate the bubble. Rising prices led to a building boom and oversupply of houses, everaccelerating prices meant more money brought smaller returns and, once again, the Fed played a role by raising interest rates. It was trying to stave off inflation, but given the proliferation of adjustablerate mortgages, it led to higher mortgage payments, pushing hundreds of thousands of homeowners into foreclosure. Once the bubble started to leak, the process accelerated, turning the mania into a panic. First, the default spread to the structured debt instruments like collateralized debt obligations and mortgage-backed securities. The system of distributing risk failed. Securitization had spread across the entire financial system -- investment and money banks, pension funds, central banks, insurance companies -- putting everyone at risk. Because the finance sector had lobbied aggressively for decades to slash regulation, the lack of oversight amplified risk. As mortgage holders defaulted, mortgage-backed securities also began to default. The subprime funding conduit from Wall Street froze up, which led big mortgage lenders like Countrywide, New Century Financial and American Home Mortgage to go belly-up. As panic set in, money market funds began to stop rolling over the commercial paper -- they wanted to cash it out. So SIVs now had to either call on their credit line from their sponsoring banks or sell assets such as the mortgage-backed securities to raise money. Mortgage defaults and forced sales of the MBSs began to push prices down even further. This forced banks to book losses, requiring some to sell more assets to cover the losses, further lowering prices, forcing them to book more losses, creating a vicious cycle. This is known as a liquidation trap. Since no one was sure about the size of the losses, banks began to hoard funds, which caused the credit markets to dry up. Over the last year, the Federal Reserve and U.S. Treasury have taken increasingly drastic measures -- lowering interest rates, pumping cash into the banking sector, allowing investment banks to borrow funds while putting up low-valued securities as collateral. This then proceeded to financing takeovers, such as the Fed providing a $29 billion credit line for JP Morgan to take over Bear Stearns in March. Then it nationalized Fannie Mae and Freddie Mac; this was followed by the federal takeover of AIG, which was done in by its gambling with credit default swaps. In the end, the legendary Wall Street banks disappeared in a fortnight -- bankrupt, acquired or converted into bank holding companies like Citigroup. But the contagion has not been contained. Whether the bailout plan can succeed is highly questionable. Many are skeptical as to whether the bailout will even restore confidence -- and credit -- to the banking system. As Reuters stated recently, "Doubts remain as to how it [the bailout plan] could immediately thaw the frozen money and credit market." Even if the bailout revives the banking sector, few economists think it will jumpstart the consumer credit machine. For one, over-leveraged, money-strapped banks will eagerly dump nearworthless securities on taxpayers in exchange for cash to bulk up their reserves. Plus, with working hours and wages declining and unemployment, home foreclosures and inflation surging, banks are in no mood to give consumers more credit, so consumption -- and hence the economy -- will continue to contract. There are many other, better options that were proposed: avoiding the poisonous mortgage-backed securities and buying equity stakes directly in troubled banks, re-regulating the industry, sending in teams of government auditors to decide the real worth of financial companies and which should live and die, creating a Home Owners' Loan Corporation to allow the government to buy troubled mortgages directly, allowing local governments to seize foreclosed homes and turn them into subsidized housing to minimize abandonment (which creates ghost neighborhoods, driving down the price of still-occupied homes), public works program, alternative energy investments, a Green New Deal. But these are political questions that depend on organizing and political power to propose, legislate, fund and enact. That's what will determine if there is a 21st-century New Deal or if Wall Street will get away with the biggest financial crime in world history. Recent reports of enhanced methane (CH4) leaks off the eastern Siberian coast (about 100 times the background level of about 1780 parts per billion CH4) and off Svalbard (Norway) have been overshadowed in the media by the collapse of the global credit bubble. At the root of both is a common thread, deregulation, including open-ended permits to pollute the atmosphere and the oceans, little-regulated financial systems and economic globalization, representing failure by governments to protect the life and welfare of their hapless populations. For some time now, climate scientists warned that melting of subpolar permafrost and warming of the Arctic Sea (up to 4 degrees C during 2005–2008 relative to the 1951–1980) are likely to result in the dissociation of methane hydrates and the release of this powerful greenhouse gas into the atmosphere (methane: 62 times the infrared warming effect of CO2 over 20 years and 21 times over 100 years). The amount of carbon stored in Arctic sediments and permafrost is estimated as 500–2500 Gigaton Carbon (GtC), as compared with the world’s total fossil fuel reserves estimated as 5000 GtC. Compare with the 700 GtC of the atmosphere, which regulate CO2 levels in the range of 180–300 parts per million and land temperatures in a range of about – 50 to + 50 degrees C, which allowed the evolution of warm blooded mammals. The continuing use of the atmosphere as an open sewer for industrial pollution has already added some 305 GtC to the atmosphere together with land clearing and animal-emitted methane. This raised CO2 levels to 387 ppm CO2 to date, leading toward conditions which existed on Earth about 3 million years (Ma) ago (mid-Pliocene), when CO2 levels rose to about 400 ppm, temperatures to about 2–3 degrees C and sea levels by about 25 +/- 12 metres. There is little evidence for a extinction at 3 Ma. However, by crossing above a CO2 level of 400 ppm the atmosphere is moving into uncharted territory. At this stage, enhanced methane leaks threaten climate events, such as the massive methane release and fauna extinction of55 million years ago, which was marked by rise of CO2 to near-1000 ppm. The $700 billion donated by the US Congress to save corrupt financial dealers are required for fast-tracked conversion from polluting to clean energy utilities and vehicles. The trillions of dollars spent since WWII on bombing peasant populations in their fields in the name of democracy and freedom are needed for replanting deforested regions of the Earth. A powerful excerpt from 'Winter Soldier: Iraq and Afghanistan' lays bare the racism at the core of the Iraq occupation. In March of this year, a courageous group of veterans brought the war home, at a historic event held in Silver Spring, Md., inspired by Vietnam veterans a generation before. "Winter Soldier: Iraq and Afghanistan" convened more than 200 soldiers who have served in the so-called "War on Terror;" like their fellow soldiers before them, who shared stories that laid bare the nightmare of Vietnam, these veterans bore witness to the crimes that have been committed in Americans' names during the occupation of Iraq and Afghanistan. The hearings lasted four days; in their testimony, soldiers described how the discarding of the military's rules of engagement and its systematic dehumanization of Iraqi and Afghan civilians has led to horrible acts of violence against innocent men, women and children. "These are not isolated incidents," was a common refrain, even as the episodes they described seemed exceptionally brutal. For many of the veterans, it was the first time they had told their stories. When I got to Iraq in 2003, I learned a new word, "haji." Haji was the enemy. Haji was every Iraqi. He was not a person, a father, a teacher, or a worker. It's important to understand where this word came from. To Muslims, the most important thing is to take a pilgrimage to Mecca, the Hajj. Someone who has taken this pilgrimage is a haji. It's something that, in traditional Islam, is the highest calling in the religion. We took the best thing from Islam and made it into the worst thing. Since the creation of this country, racism has been used to justify expansion and oppression. Native Americans were called "savages," the Africans were called all sorts of things to excuse slavery, and Vietnam veterans know the multitude of words used to justify that imperialist war. So haji was the word we used. It was the word we used on this particular mission I'm going to talk about. We've heard a lot about raids and kicking down the doors of people's houses and ransacking their houses, but this was a different kind of raid. We never got any explanation for our orders. We were only told that a group of ?ve or six houses was now property of the U.S. military, and we had to go in and make those families leave their houses. I tried hard to be proud of my service, but all I could feel was shame. Racism could no longer mask the reality of the occupation. These are human beings. I've since been plagued by guilt. I feel guilt any time I see an elderly man, like the one who couldn't walk who we rolled onto a stretcher and told the Iraqi police to take him away. I feel guilt any time I see a mother with her children, like the one who cried hysterically and screamed that we were worse than Saddam as we forced her from her home. I feel guilt any time I see a young girl, like the one I grabbed by the arm and dragged into the street. We were told we were ?ghting terrorists; the real terrorist was me, and the real terrorism is this occupation. Racism within the military has long been an important tool to justify the destruction and occupation of another country. Without racism, soldiers would realize that they have more in common with the Iraqi people than they do with the billionaires who send us to war. I threw families onto the street in Iraq, only to come home and ?nd families thrown onto the street in this country, in this tragic and unnecessary foreclosure crisis. Our enemies are not ?ve thousand miles away, they are right here at home, and if we organize and ?ght, we can stop this war, we can stop this government, and we can create a better world. October 10, 2008 How Badly Can the 'Experts' Ruin the Planet? Look no further than the World Bank to see how many economic, social and environmental problems so-called experts can make worse. Remember the World Bank, that global "development" institution based in Washington, D.C., that dispenses billions of dollars a year to poorer nations with the declared intent of ending global poverty? We -- and many of you -- spent decades protesting the World Bank and documenting the bank's projects and policies that exacerbated economic, social and environmental problems. In the United States, thousands of protesters took to the streets in the years prior to 9/11 to condemn the financial behemoth. Across the Third World, where the impacts of World Bank lending are felt on the ground every day, such protests began even earlier. This weekend, World Bank President Robert Zoellick will use the occasion of the World Bank and International Monetary Fund's annual meetings in Washington, D.C., to announce that critics like us were oh so wrong and that we should look to the World Bank to play a key role in solving the world's food, climate, poverty and other crises. Were we indeed wrong? Could millions of our allies in developing countries, including so-called beneficiaries of the development mega-agency, have possibly been so wrong? Is it a time for a mea culpa? Having taken a close look at the World Bank past and present in our recently published book, Development Redefined: How the Market Met Its Match, we'd say it's not. When the Institute for Policy Studies started monitoring World Bank greenhouse gas emissions in 1997, the Bank was investing roughly 100 times more in fossil fuel energy projects than in clean energy. Tens of billions of dollars of dirty energy lending later, the Bank certainly has demonstrated its ability to contribute to climate chaos. Here, Zoellick is onto a truth of some sorts. If you really get down to the basics, over the course of its history, the World Bank has been all about "inclusive globalization." For example, over the past two decades, the economic-globalization free-market model it pushed on its borrowing countries has propelled the total number of billionaires in the world from around 100 to 1,125, with a far more inclusive group of countries being home to the billionaires today. So too does the World Bank now acknowledge that its math was wrong and the number of people living in poverty today is actually much higher than the Bank's prior calculations asserted. In other words, "inclusive globalization" has helped create a larger, more inclusive class of poor people. Way to go, World Bank. The World Bank has loaned tens of billions of dollars to Africa since the Bank set up shop right after World War II? The fact that poverty and inequality have risen in most African countries over that same period is surely pure coincidence. Consider the case of Malawi, where the government explicitly rejected the World Bank's advice on how to deal with a crisis in domestic corn production that threatened widespread famine. The result of ignoring the Bank's expertise? By late 2007, Malawi was not only feeding its own population, but also exporting corn. Dare we suggest that if Zoellick really cares about sub-Saharan Africa, he would encourage other countries to follow Malawi's example and ignore the Bank's advice? Indeed, check out the Bank's preferred solution to climate change. It's to get governments out of the picture and let the invisible hand of "carbon markets" prevail. Talk about ingenuity regarding an appropriate role for the public sector: The Bank has devised a way to make hundreds of millions of dollars off carbon markets by charging a hefty commission on trades. Or take the food crisis. By pressing countries to follow a set of policies geared to shift farmers from subsistence food crops (rice and corn, for instance, that the grower could eat) to export crops (cut flowers, ornamental plants, gourmet veggies -- that either can't be eaten or aren't meant for local stomachs), the Bank has created a "freer" global market for farm products grown largely by or for big agribusiness companies. Southern countries get to be more vulnerable to and dependent upon the whims of an unfair and volatile global market. And, now there's a role for governments to play in quelling the ensuing "food riots." Who could better grasp the challenges faced by people who make less than $2 a day than people who make hundreds of dollars a day, often tax-free? Who could better understand the needs of poor people than experts who zip in and out of poorer countries and stay in five-star hotels? And, as for those World Bank staff who do live in-country, who could better comprehend the realities of the average poor person there than Bank staff who typically live in mansions with chauffeurs and gardeners? The economic crisis, however painful, will lead to at least one positive outcome. Our economy in recent decades has been propped up by an alarming degree by profligate consumer spending and wasting of resources prompted by an avaricious credit industry. Even before the crisis, it was obvious that the traditional American Dream of comfort and security had been displaced by a "more is better" focus that promotes not quality of life, but rather the unbridled production and consumption of stuff. There was never any chance that could continue indefinitely. Recently, the Global Footprint Network issued a report stating that by September 23, humanity had consumed all the new resources the planet will produce for the year. For the rest of 2008, we are in the ecological equivalent of deficit spending, drawing down our resource stocks -- in essence, borrowing from the future. Sound familiar? We can't hope to keep to our economic budget if we can't keep to our ecological budget. The "more is better" version of the American dream is unsustainable environmentally, fueling a level of resource consumption that the planet cannot keep up with. It is personally unsustainable, drawing American families into a work-and-spend treadmill that depletes savings and clutters lives. And now we see it is unsustainable economically, as well. Whatever economy emerges from this crisis will need to put less emphasis on "more" stuff and greater emphasis on more of what matters -- like healthy communities, a healthy planet and a higher quality of life. In righting the economic ship, the end game shouldn't be to plug up a broken vessel, but to move to something more seaworthy -- one that sails within both personal and ecological limits. We are facing crises of freshwater, food, deforestation, and ocean health. We need leadership in the protection of all our natural resources. All of our natural resources are in peril because of what we do and what that does to our planet. We are facing a fresh water crisis. We are facing a food crisis. We are facing a crisis over deforestation. And we are facing crises in our oceans. While carbon emissions from fossil fuels pollute the air, so does a lot of other stuff. Now is the time to press for leadership in the protection of all our natural resources. We must increase our freshwater supply by about 20 percent by the year 2025 to meet world demand, and 90 cities still dump sewage into it. The price of most food has doubled over the past year, forcing millions deeper into poverty and malnourishment. There is now six times as much plastic as zooplankton in parts of the Pacific Ocean, and 90 percent of the big fish on Earth have disappeared. Meanwhile, we have an ever-increasing waste and electronic-waste burden on our hands. We each create twice as much trash per day as we did 40 years ago. The average size of our landfills has multiplied 25 times in that period as well. And our e-waste burden is so bad that we ship 80 percent of it overseas to countries with weak environmental standards. These countries in turn make products from our discards and ship them right back to us. (And we wonder how lead paint gets in toys.) As well, up to 40 percent of global wood production is from illegal timber operations. Deforestation not only displaces people and endangers species, it is the second biggest cause of climate change. (It isn't only fossil fuels that cause global warming.) To be sure, an alternative energy supply is needed and important. But let's not forget the importance of other environmental factors crucial to our health and well-being, not to mention the planet's. The Editor of the Global Information Media is now accepting articles, letters, reports, research papers, discussions and global dialogues, and messages for publication. This Media is a way to communicate workable sound solutions to problems arising in the world. Let us share our problems and workable sound solutions. Sharing information is a necessity to all life and humanity's survival. Our world is changing fast before our eyes, and we must react quickly and hard to protect all life on Earth. No hesitation! Right now and no waiting! Life on the planet is our first priority. We must protect it at all costs. We, global citizens, fight to protect life on Earth for this generation and the next ones. We are the defenders of the environment and the global life-support systems. We know who the beasts are, and how they destroy the living on our planet. We have rallied together all over the world to protect our home, Earth. But this time we are not alone. We know it all! We know how everything works. And we will do whatever it takes to protect life on Earth. "We the Peoples", the Global Community, are the Earth revolutionaries, and we will protect life on Earth at all costs. GIM was organized with more than sixty sections. Each section allows everyone to participate in the Global Dialogue. You pick an issue, and you participate. All sections may contain any of the following information: abstracts, research papers, notes, outlines, videos and other works of art, posters, articles, letters, press releases, reports, and newsletters. They may also contain discussions, global dialogues, brain-storming exercises on issues, or just email messages from interested participants and groups. Just so you all know we don't pay anyone, and we don't pay expenses. We do volunteer work for humanity. We expect volunteers to be responsible and accountable of all their actions. We do soft activism work. The Global Constitution shows us how to operate our organization. We follow Global Law as shown in the Global Constitution. All those who do volunteer work for us must become familliar with it and become 'global citizens'. We want our volunteers to be completely loyal to the Global Community and to the values and principles we promote. The world is in a state of perpetual turmoil. We are worlds within worlds orbiting in and through each other’s space. Our interactions with one another can be planned and executed in a caring, considerate manner so that all may exist and not destroy the other. A good place to start this day would be to see the people living in far away places as we see our neighbors. Neighbors are people we should see as people very much like ourselves. Love your neighbors as yourself. Many scientists have shown that our genetic make-up as human beings are not that much different than that of many other life-forms. The reality is that we as people are not that much different from one another. Our education and upbringings are different and created cultural and religious differences. Conflicts originate often because of these cultural and religious differences. My teaching for the day is to make the effort to understand what make us different from one another and find a way to appreciate those differences. We also have to make the effort of understanding other life-forms in Nature and appreciate the differences. Because of brain capacity, we dont expect other life-forms of understanding us, but we do have a moral responsibility of understanding them and appreciate the differences. God loves diversity in Nature and in Souls. God loves good Souls from all cultures and religions, and from all life. Yes there is a Soul in every living life-form and God loves them too. As a first step to getting help, all nations can and should approve those first three sections on the Scale of Global Rights. The approval would supersede the political and physical borders of participating member nations. The Global Protection Agency (GPA) would have the approval from all member nations to give immediate help, bypassing normal government protocols. Somewhat like an emergency unit but at the global level. That is what those first three sections mean. They represent an efficient and immediate emergency response to help. First, participating member nations need to give their approval to the Global Protection Agency ( GPA). The GPA is a global organization much like the World Trade Organization (WTO) for trade between nations, the World Health Organization (WHO) for health, or the European Union, North American Free Trade Agreement (NAFTA), South American Community of Nations (SACON) for trade and economics. The GPA offers an efficient emergency response to help. The GPA is a short term solution, an immediate and efficient response to help. There are also long term solutions. As with the short term solution, the most significant long term solution is also related to the Scale of Global Rights. The Scale was entrenched in the Global Constitution and is thus the fundamental guide to Global Law. Now the Scale of Global Rights is a long term solution and is also a part of the Global Movement to Help of the Global Community. The Scale was designed to help all life on Earth. What would be preferable is that nations unite amongst themselves to help. Over time, we have seen the creation of the United Nations, the European Union, the South American Community of Nations, and the North American Free Trade Agreement. Except for the UN, these organizations are mainly concerned with trade and economics. The Global Community offers a more meaningful union in the form of nine or more Global Governments. For instance the South American Community of Nations can be a Global Government by simply accepting the Global Constitution as a way of dealing between member nations. A Global Government is concerned not only with economics and trade, but also with the environment, health, agriculture, energy, food, social, cultural and many other essential aspects. The Federation of Global Governments is the place of meeting between Global Governments. The very first step of the Federation, and maybe the only one for several decades ahead of us, would be the approval of essential services amongst the participating member nations. The Global Community has researched and developed such services and listed them here. All of them are already in operation on a small scale. I believe that there is no greater task in the world today than for the Global Community to proceed through the maturation of its leadership, emerging from a more self-interested adolescence as a global leader into a nobler adulthood. We have the potential to act as a torchbearer for a better tomorrow. Do we heed the call? I hope this message has convinced many international organizations and the millions of people who have been with us over the past decades, that the question of how to proceed with that maturation is of far deeper significance than the reforming of the United Nations. In fact the United Nations should not be reformed it should be replaced by the Federation. I thus pray that we move with wisdom, grace, clarity, and love in the days, years, and even decades ahead. Our policy concerning personal information is simple: we dont show it. That includes phone numbers, fax numbers, addresses and any personal notes. Please do indicate what you consider a personal note as sometime it is hard to tell. What we show is the work done by participants and authors, and their email addresses if any. We will show any work concerning issues, email discussions, opinions, articles, letters, reports, works of art, research papers, discussions and global dialogues, and messages for publication. And also please note that our computer harddrives will not be containing personal info either. This is because of the damage hackers can do. On and around May 26, 2008, millions of people joined together in a global call to celebrate Life, the gift to the universe from God. Congratulations to all on an incredible Life Day! On May 26, 2008, the Global Community has asked all Peoples of the world to participate in this celebration of Life in your own community. The following project was appropriate to everyone. 1. What are the most important issues that would allow your community become more sustainable? Over the past several years, many communities have held Life Day dialogues to determine the answer to this question. We look forward to hearing from all of you. 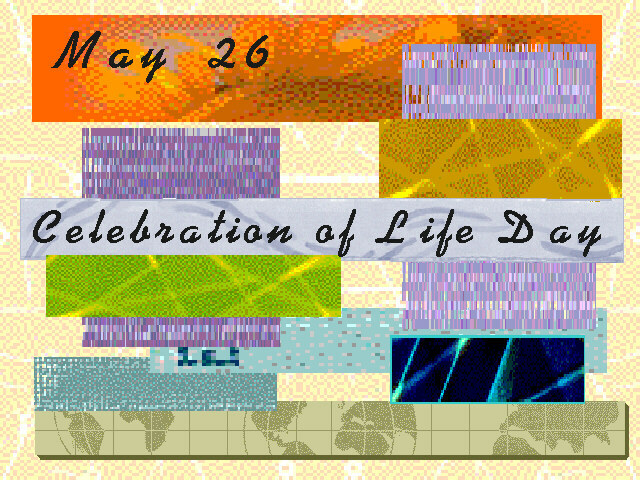 Visit our website for more details concerning the Celebration of Life Day. On May 26, as part of the Global Community Peace Movement, the Human Family,we will be rejoicing with all Peoples of the world , and all life, for the annual Celebration of Life Day. Life is the most precious gift ever given by God to the universe and this event needs to be celebrated. The Divine Will or Will of God is the most powerful force of the universe and is pure spiritual energy. The Will of God is for life to reach God, God’s Pure Light, in the best possible ways. Life is the building block through which Souls can have a meaningful relationship with God. By observing the Universe, the galaxies, we are observing and studying God. We are seeing His magnificence, His greatness, and His complex making. There is more to the Universe we observe today, that is, there is more to God, much more. God is self-existent, eternal and infinite in space and time. Follow God's Word. God's Plan was revealed to humanity a short while ago. The Soul of Humanity is helping to bring about the event of Peace in the world. Knowing that Earth is a spiritual entity as well as a physical entity in space and time in the universe we begin to have a better relationship with Earth and with all its living inhabitants. This way Earth management will become a spiritual and a natural process whereby each person is responsible and accountable for its management the best they can. Peace in the world and Earth management have for too long been in the hands of and affected by government and business leaders, in the hands of a few people on the planet, as opposed to being in the hands of all of us (7 billion people on Earth) working together to keep our planet healthy. We are the keepers of the Earth. * enter God’s Heaven, His Spirit, His Pure Light, His universal mind and global consciousness. We the Peoples of the Global Community, the Human Family, are reaffirming faith in the fundamental human and Earth rights, the Scale of Human and Earth Rights, in the dignity and worth of the human person, in the equal rights of men and women and of nations large and small. We the Peoples implies every individual on Earth, every community and every nation. Earth management is now a priority and a duty of every responsible person on Earth. The Global Community has taken action by calling the Divine Will into our lives and following its guidance. Divine Will is now a part of the Soul of Humanity to be used for the higher purpose of good and life's evolution. We will learn to serve humanity and radiate the Will of God to others. Humanity welcomes the "Belief, Values, Principles and Aspirations of the Global Community" (see the Global Constitution on our website) with Faith in the Divine Will and without fears such as the fear of change. Humanity seeks meaningful experiences and embraces the future for the better. Divine Will has caused the event of the Global Community. Our time is the age of global cooperation and symbiotical relationships. There are many different kinds of symbiotical relationships. Symbiotical relationships exist between nations of the European Union. It is mainly an economic base symbiotical relationship. Other types of symbiotical relationships maybe created all over the world between communities, nations, and between people themselves. The Global Community, the Global Governments Federation, and the Global Government of North America are examples. They may be geographical, economical, social, business-like, political, religious, and personal. There has always been symbiotical relationships in Nature, and between Souls and the matter of the universe to help creating Earth and life on Earth to better serve God. The Global Community has begun to establish the existence of a meaningful global co-operation all over the planet. National governments and large corporations have taken the wrong direction by asserting that free trade in the world is about competing economically without any moral safeguards and accountability to peoples and the environment. The proper and only way is for free trade to become a global cooperation between all nations. Surely, if we can cooperate in fighting against terrorism, then we should also be able to cooperate in fighting against the effects of the type of free trade and the emergence of the planetary trading blocks as applied by national governments members of the World Trade Organization(WTO). It has already been shown (see Newsletters on our website) that these effects will be disastrous socially and environmentally and are a direct threat to the existence of life on Earth. The Global Community is proposing a solution that the process of trading within the planetary trading blocks be changed from a spirit of global competition to that of global economic cooperation. This is the new way of doing business, the new way of life. The Global Community has made clear that globalization and planetary trading blocks should be serving the Human Family and not the other way around, the people around the world serving the very few rich individuals. The September 11 event was the result of bad trading of arms and oil and the absence of moral responsibility and accountability in our way of doing business with the Middle East nations. By applying proper moral safeguards and accepting responsibility and accountability of all products (arms and oil in this case), from beginning to end where they become wastes, each corporation would make free trade and globalization serving the Human Family. The September 11 event was also a turning point in human history and indicated the end of the last superpower in the world and the birth of the Global Community. Over its long past history trade has never evolved to require from the trading partners to become legally and morally responsible and accountable for their products from beginning to end. At the end the product becomes a waste and it needs to be properly dispose of. Now trade must be given a new impetus to be in line with the global concepts of the Global Community. When you do exploration work, and develop, manufacture, produce, mine, farm or create a product, you become legally and morally responsible and accountable of your product from beginning to end (to the point where it actually becomes a waste; you are also responsible for the proper disposable of the waste). This product may be anything and everything from oil & gas, weapons, war products, construction products, transportation and communications products and equipment, to genetically engineered food products. All consumer products! All medical products! All pharmaceutical products! In order words, a person (a person may be an individual, a community, a government, a business, an NGO, or an institution) becomes responsible and accountable for anything and everything in his or her life. Certainly an important action has been for the Canadian Government to ratify the Kyoto Protocol as it is. No more waiting! Time for action is now! We are all responsible for the creation of global warming, and there are plenty of observable effects. Greenhouse gases are accumulating dangerously in the Earth's atmosphere as a result of human activities, and temperatures are rising globally due to these activities. Climate changes have to be manage without delays and the ratification of the Kyoto Protocol is only the beginning of a long fight for the protection of life on Earth. There is much more to be done to even come close to what we have to do. The ratification was only the beginning to help save the next generations. Global consumption is a very important aspect of globalization. Consumers should be concerned with the impact of their decisions on the environment but also on the lives, human and Earth rights and well-being of other people. Since one of the key functions of families as a social institution is to engage in production (selling their labour in return for wages) and consumption (using those wages to buy goods and services), then the role of families has impacts on sustainable consumption and development. Corporations are required to expand their responsibilities to include human and Earth rights, the environment, community and family aspects, safe working conditions, fair wages and sustainable consumption aspects. Global Community has summarized the rights of every person on Earth by developing the Scale of Human and Earth Rights. The scale will eventually be replacing the Universal Declaration of Human Rights. The Global Constitution established all rights. Just as corporations have social responsibilities and so do consumers in societies. Consumers are socialized to improve the quality of their lives. Quality of life is a multi-dimensional, complex and very subjective concept. For instance, someone who has changed their consumption habits to better ensure that their choices will make a better quality of life for themselves, the environment and future generations, may be seen by others as having a lower or inferior quality of life since they have removed themselves from the materialistic mainstream characteristic of our consumer society. Someone may feel that an absence of violence and abuse in their life leads to a higher quality of living even though they have fewer tangible resources, money, or shelter; peace of mind and freedom from abuse has increased the quality of their daily life relative to what it was like before. There are universal quality of life values which lead to "human betterment" or the improvement of the human condition. In addition to the value of species survival (human and other living organisms), they include: adequate resources, justice and equality, freedom, and peace or balance of power. A better quality of life for all people of the Global Community Earth Government is a goal for all of us and one of our universal values. Global Community found that an adequate level of health care is a universal value as well as a human right. We expect adequate health services to be accessible, affordable, compassionate and socially acceptable. We believe that every individual of a society is co-responsible for helping in implementing and managing health programmes along with the government and the public institutions. Being unified under the Soul of Humanity, Divine Will, God the Spirit and the Human Family dissolve all barriers and expand our global consciousness. We become more whole and complete within ourselves and as a group. Our common Spirit is able to resolve planetary problems in a coherent way. One common 'global Vision' allows us to see how all the parts of the whole relate to each other. We have the right relationship with one another, with all lifeforms and Earth itself, and with the Soul of Humanity, the Divine Will and God the Spirit. On August 22 of every year the Global Community celebrates the Global Cultural Day, the Cultural Appreciation Day. The event's theme is "Culture, Values and Social Development." Noting that culture and development are not mutually exclusive, event organizers are asked to promote a union between historical preservation and future local - global growth. The Global Community is rich with tradition and art. Culture is certainly tangible - churches, temples and monuments; and intangible - heritage with performing arts, fine arts or visual arts. Every community is based on a society distinctly different from any other country and its people. The Cultural Appreciation Day celebration. The Cultural Appreciation Day celebration promotes the meaning of culture, the real nature of Humanity and what inhibits its development. It is for all, regardless of education, age, race, political or religious beliefs. The idea of the Cultural Appreciation Day celebration is that Humanity in truth is limitless, and that there is a unity underlying all the apparent diversity in our daily lives. Activities during the celebration may include mask making, cooking, singing, music, dance/drama, and puppet making by and for the children. The day provides vendors, live entertainment, children's activities, and food in celebration of the various cultural groups. The Cultural Appreciation Day celebration occurs at the same time and is an important part of the Global Exhibition. For the third year since the first time ever promoting of a Global Exhibition, there is a Global Exhibition at the time of Global Dialogue 2008, and at the same site in Nanaimo. It is also occurring everywhere else in the world along with Global Dialogue 2008. People of all nations are asked to organize a Global Exhibition during the period August 17 - August 22 of each year. The Global Community has a symbiotical relationship with many people and organizations all over the planet. We work together to help create a better future for all life on Earth. Check the website especially created for educating on the issue of Earth ownership. Global Dialogue 2009 has many other issues than Earth ownership, and we wish to set up symbiotical relationships with other groups on those other issues for the benefits of all life on Earth. Anyone interested please contact us. Proceedings of Global Dialogue 2008 are now ready for reading and found on the Global Community website. As a start to reading the Proceedings we suggest you read the summary table of the Proceedings of Global Dialogue 2009 shown here and as evaluated by the Global Community Assessment Centre (GCAC). And again the next step might be to read the info from Participants and authors. Global Files of our participants show more of the work presented to the Dialogue. Please let us know of any corrections and omissions, or if you would prefer your name and info not be published on the Global Community website. Our services are free, and we do not charge fees. These five sections give you a good idea of what we have done throughout the year from September 1st 2007 to August 31 2008, and what needs to be done in the coming years. The final product of this global process is to give humanity a sense of direction for a better future. This final product is shown in the Proceedings. We are showing the way.